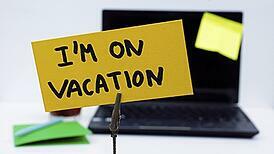 So you have some time off but traveling is not on the docket this year. Maybe you're saving for a new car or another big ticket purchase, or perhaps you have only a few days and leaving town would be too rushed. Enjoy the benefits of vacation without the expense and hassles by planning a relaxing "staycation" at your Springs Apartments home. Here are some of our favorite tips for leaving stress behind without leaving home. You may even start a new family tradition! 1. Go "Off the Grid"
Family, friends and even co-workers may assume it's OK to contact you since you're still in town. Turn off your cell phone ringer and respond to voicemail only if you want to. Be sure to set an out-of-office automatic reply for your work email stating that you will not be checking messages until you return. Literally forget about time by removing your watch and stashing it away with your clocks in a closet or drawer. People often live for years in a city without ever seeing the attractions that bring visitors in from out-of-town. Put yourself in a tourist frame of mind and plan excursions to those great local sites you've been meaning to see. Don't overlook your city's cultural offerings such as museums, theaters and performance halls. Most cities, no matter how big or small, host a variety of festivals with themes ranging from culinary, such as food and wine tastings, to offbeat, like the "Blue Ribbon Bacon Festival" in Des Moines, IA. As a bonus, these events make excellent people-watching opportunities! Choose one or more themes based on favorite film types or actors. Pick up several DVDs and stock up on popcorn, soda, candy and other munchies. Turn down the lights, let everyone stake out their favorite spot, and let the magic of the screen take over. Join forces with two or three friends and take turns hosting kids' night with pizza, games and other fun activities. The parents who are "off-duty" are free to enjoy a leisurely date night. One of the nicest things about vacation is freedom from cooking. Order carry-out or have dinner delivered from a variety of restaurants for a culinary adventure minus the work. Make it a global experience by including Thai, Indian or other exotic cuisines you've wanted to try. If you're in the mood to splurge a bit, get some pampering by spending a night at a comfortable, amenity-filled hotel. Treat yourself to spa time, lounge around the pool and dine on room service. Do you have a successful staycation idea to share? Tell us about it in the comments!